Discover St Petersburg's underground art scene on a 1.5-hour tour of its palatial-looking metro stations! Led by a local guide who is passionate about the city's art and history, the tour includes visits to the must-see stations around town: Ploshchad Vosstaniya, Avtovo, Kirovskiy Zavod and Admiralteyskaya. See bas-relief carvings, learn about Soviet Union history and visit one of the world's deepest underground stations. Discover the hidden secrets of St. Petersburg at night and marvel at its tucked-away oddities on this small-group walking tour with a guide. Visit the city's oldest and most beautiful railway station, discover metro station art relics, and sip on vodka in a bar famous among locals. Enjoy personal attention from your guide on this small-group tour, limited to 12 people.Special Offer - Book by July 18, 2017, and travel by December 31, 2017, to save 20% off our previously offered price! - Book Now! Learn all about St Petersburg's history and sights on a 3-hour walking tour, led by a private guide! The itinerary can be tailored to specific interests; simply let the guide know when the tour starts. Then, head off to discover top St Petersburg attractions like Palace Square, Winter Palace, Senate Square and more. 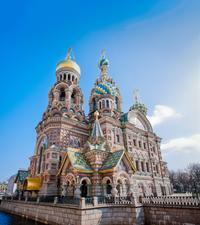 This exciting tour also includes visits to St Isaac's Cathedral and the Church of the Saviour on Spilled Blood. Hear stories of revenge, romance and Imperial aristocracy on a 2-hour evening walking tour of St Petersburg! Focusing on the eccentric St Peterburgians of bygone days, the commentary on this fascinating legends tour is rich with mystery and humor ' just like the city itself. Learn of the exploits of Catherine the Great and her secretive son Tsar Paul I, and see Mikhailovsky Castle (St Michael's Castle) along with lesser-celebrated gems like the diminutive Chizhyk-Pyzhik Monument. Experience the cultural highlights of St Petersburg on a 3-hour walking tour with a guide. As you explore the spectacular city on foot ' from Palace Square to St Isaac's Square ' you'll learn about its imperial history and view prominent landmarks along the way. See St Isaac's Cathedral, stroll down Nevsky Prospect, and pass the Summer Gardens and the Field of Mars on the way to the most famous church in town. Enjoy personal attention from your guide on this small-group tour, limited to 12 people.Special Offer - Book by July 18, 2017, and travel by December 31, 2017, to save 20% off our previously offered price! - Book Now! Step back in time to Leningrad, communist-era St Petersburg, and explore the city on an evening walking tour, seeing intriguing sites from its communist past. The 2-hour tour takes in attractions like the former KGB (secret police) facility (known as The Big House), a Soviet-era caf', the Field of Mars and a restored battleship. Hear tales of the two key rulers, Lenin and Stalin, while enjoying an insight into life in St Petersburg between 1917 and 1991.